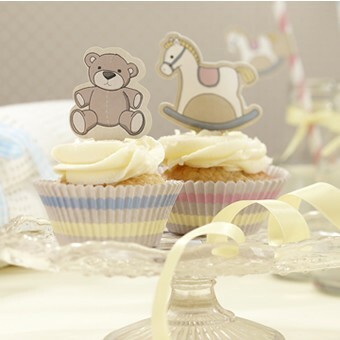 Rock-a-Bye Baby Cupcake Kit are perfect for baby showers, new baby, first birthday or Christening. Each kit contains 50 cases and 20 toppers. There are 25 pink and yellow & 25 blue and yellow cupcake cases (width 4.5cm across the base) along with 10 Teddy & 10 Rocking Horse cupcake toppers to pop in the top of the cakes. The toppers are 4.5cm high.